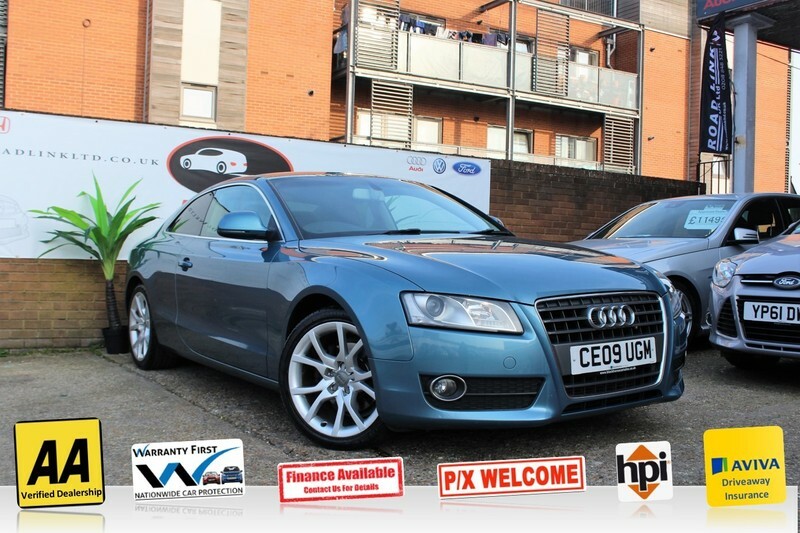 Audi A5 2.0 TFSI SPORT 2009 - Full Service History, V5 Document, MOT valid till February next year, CD/MP3 Player, Radio, Speakers, 18" Alloy Wheels, Leather Seats, Parking Sensors, Start/Stop System, Steering Wheel Controls, Traction Control, Central Locking, Climate Control, Electric Windows, Power Assisted Steering, Electric Mirrors, Engine Immobiliser, ABS, Air Conditioning, Adjustable Steering, Body Coloured Bumpers, Daytime Running Lights, Front Fog Lights, Privacy/Tinted Glass, Front Airbags, Side Impact Airbags, Safety Belts, Safety Belts Rear, ISOFix Anchor Point for easy installation of child seat, Brake Assist, Free buying experience where you can drive away the same day. All our cars come with 1-year AA breakdown cover, HPI clear certificate and 3 months warranty, part-exchange welcome, finance available at best rate. We also offer 5 days drive-away insurance. At Road Link ltd we ensure that all of our vehicles are inspected and in great working condition. If you have any queries please contact us on 0208 848 3221 / 077 5666 5666 or via E-Mail.